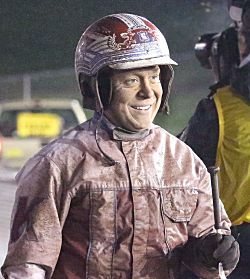 Hightstown, NJ — Matt Kakaley’s drive to his first Breeders Crown winner’s circle was as memorable as the stretch drive to victory, and even more emotional. Kakaley entered last Saturday’s Breeders Crown finals at The Downs at Mohegan Sun Pocono in search of his first trophy. He ended the night with two. The second, not unexpectedly, came with favorite Dorsoduro Hanover in the 3-year-old colt and gelding pace. The first, though, was something of a surprise. It came six races earlier with 52-1 longshot Percy Bluechip in the 3-year-old filly pace. As the 30-year-old Kakaley returned to the winner’s circle with Percy Bluechip, he could not help but think back to last March when he was injured in an accident at Yonkers. Kakaley was sidelined for two months and required three surgeries, including one for a broken orbital bone and another for a fractured collarbone. 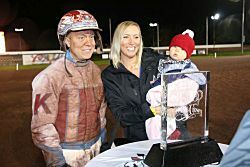 Matt Kakaley is joined in the Breeders Crown winner’s circle by his girlfriend, Annie Larrabee, and their daughter, Arianna. “The winner’s circle was a little overwhelming for me, just full of emotion,” Kakaley said. “Coming back, I was just thinking, man, seven months ago I was on the sidelines not even sure if I was going to be able to drive anymore. My eye was really bad. I don’t think people really understand how bad it really was. The people that were around me were a great support system. Obviously everything came back and I’m OK, but at the time I was really worried. Kakaley, who has competed regularly at Pocono for the past eight years and won a driving title there in 2011, was winless in 42 Breeders Crown finals prior to breaking through with Percy Bluechip. Kakaley positioned the filly second on the outside behind favorite Kissin In The Sand, who was engaged in a battle with Youaremycandygirl through torrid early fractions. As the field turned for home, Kakaley dropped his whip but was still able to sweep by the leaders in the stretch to win by three-quarters of a length over Kissin In The Sand. Matt Kakaley and Percy Bluechip won the Breeders Crown 3-year-old filly pace at odds of 52-1. It was somewhat fitting Kakaley’s first Breeders Crown win came with a longshot. Of his 42 previous drives in finals, 27 were at odds of 40-1 or longer and nine of his 11 on-the-board finishes were at odds of at least 27-1. Of course, the odds mattered little to Kakaley. And then he got two. Dorsoduro Hanover, Kakaley’s first favorite in a final, took the lead after three-eighths of a mile and cruised to victory by 3-1/2 lengths over Lather Up. The gelding has finished no worse than second in seven consecutive races, winning five. His victories in addition to the Breeders Crown include the Adios and Pennsylvania Sire Stakes championship. He was second in the Meadowlands Pace and Little Brown Jug. Matt Kakaley is all smiles in the Breeders Crown winner’s circle. USTA/Mark Hall photos. Ronnie is trainer Ron Burke, for whom Kakaley drives on a regular basis. Kakaley’s two wins were part of a three-Crown night for the Burke Brigade. And as the rain-soaked and mud-covered Kakaley turned to walk away on a 41-degree Pocono night, he flashed a big smile.